For this baby's bottom cake, I used a Ten inch round cake pan to make the bottom cake and I used half of a sports ball pan to make the baby's bottom. I used rice krispy treats to make the feet and legs. I used rolled fondant to make the blanket and stars. Frost the bottom cake smooth. Stars the legs and baby's bottom with tip 16. 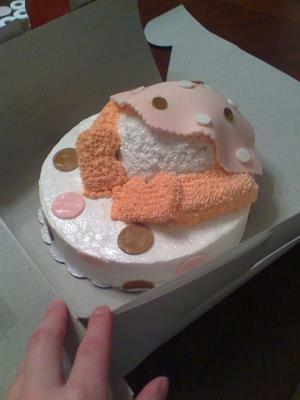 Put the blanket over the icing on the baby's bottom and then add the dots. Just put a little bit of water to attach them. Very cute! And cute idea!!!!!! You did a very nice job!!!!! !